1. Any issue to provides opposite direction to the legacy exit signage? This happens only when disaster area blocking the shortcut has been detected and confirmed by safety manager while the detour escape routes are valid. Routes that return to a dead-end or looping position can be 100% excluded by SERA. Without any disaster area, the system generates the same direction with exit signage. 2. Any issue from incorrect decision about disaster areas? Areas are determined by interfacing fire detection system or manually set by safety manager. Official test has been done by firefighting institute (KFI) to test performance of sensors. The system can only be activated by the responsible safety managers. 3. What data should be prepared for Smart Evacuation System construction? You must prepare a safety regulation that includes your company’s disaster response procedures along with floor plans for the entire facility. If you don’t have specific safety regulation, your company may adopt the contents included in our system. 4. How can your system easily bring interface with an existing building system? Our software platform is made easy to connect with existing building management systems such as fire receivers. In addition, the focus is on providing safety for the exits and reads where our stations are installed, so the easy connection with the existing building system is an important point. 5. Is it possible to customize and install the specific sensors the customer wants? It is possible to customize and install the specific sensors, but it may result in higher unit prices because we need to rebuild the station unit itself. Therefore, we recommend integrated control and evacuation linkage method through interface with our server system and the existing external sensing system, rather than customizing sensors in the station. 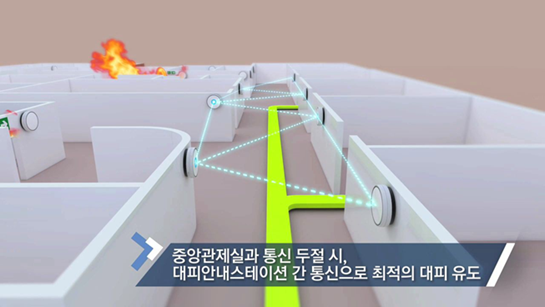 It is possible to detect and respond to the disaster situation by connecting the existing fire detectors and other equipment to the main server. This will be a more accurate and faster disaster countermeasure. 6. What is the convenience of construction for power and communication line? To apply our system, construction for power supply is essential because our stations require constant power. However, it is expected that there will be no need of the construction such as digging the ceiling or the wall since the emergency power sources are usually installed in the area where the emergency light is installed. In addition, construction of communication line can be minimized because our system is connected to network coordinator equipment through wireless communication. 7. How can you prove your product reliability? The main part is to demonstrate the reliability of our solution through actual data. We are in the process of acquiring actual data on how much the evacuation efficiency is improved through the existing project, and plan to connect with the simulation tool to show our reliability effectively. The point is that our solution will lead to better efficiency than the conventional evacuation guidance system. This has been proved in a project supported by European Commission and carried out with simulation tools. In addition, SERA(Safe Evacuation Routing Algorithm) self-developed by CORNERS guarantees optimized performance and quality for real-time emergency evacuation environment. The algorithm demonstrates superior real-time performance against the world‘s top commercial optimization engines. The calculation speed to derive optimized result for the evacuation path is 6~15 times faster. By directing the Max flow effect, it guides as many people as possible to escape to safety zone faster. People are guided to the route that can escape the fastest among the various paths resulting from the flow maximization. Time expanded modeling method prevents bottlenecks by guiding people to un-congested routes every hour. 8. How about your communication interference caused by walls? We use LoRa communication to connect stations and server. So LPWA Gateway should be installed for communication. Before installation, LoRa TestKit is used to confirm communication shaded area and then confirm the location and quantity for LPWA Gateway installation. If there is communication interference due to walls, the problem can be solved by setting the bridge to the station and extending the distance of communication. 9. What if there is no communication network in case of disaster? Our station detect the occurrence of fire and gas leakage by normal power supply at normal times, and automatically switch to build-in battery when the power connection fails. They provide evacuation voice and lighting depending on the situation when operating by the battery. In addition, even when IP communication with the network coordinator and the server is interrupted, communication between stations is continued. Even if the communication network is cut off due to the disaster situation, it can be connected via station-to-station networking and provide safe guide. 10. What is the size and duration of the built-in battery? Our station are equipped with built-in batteries in case of power off. The capacity of the battery is 2,800mAh. In case of emergency, our stations last for more than 60 minutes with only the built-in battery. If the stations don’t work for evacuation alarm, it can last up to 3 hours with the built-in battery alone. 11. Does the lighting type station have a built-in battery? Our lighting type station (CST-L001) consists of the Gobo Lighting display and the LoRa Relay module. The Gobo Lighting display does not have a built-in battery, but the LoRa Relay Module has it. So this station also operates in power off. It is recommended to install a separate UPS power source when you want to install lighting type station. If it is done, emergency operation can be done with built-in battery of LoRa Relay module even when power is cut off. 12. How much does it cost to build Smart Evacuation System? Our Smart Evacuation System is a solution that provides evacuation guidance station, communication equipment and all related software integrally. In order to estimate the construction cost, it is necessary to calculate the quantity of stations and communication devices required according to the configuration and size of the space to be applied to the system. You will be charged the entire cost based on the list price of each device. Therefore, there is a difficulty in telling the cost of the installation without any specific plan for the space. If you need a specific estimate of system construction cost, please contact the company separately and proceed with the consultation. 13. Is there a limit to the number of stations covered by a single gateway? Our LPWA Gateway, which connects communication between various stations ans servers, covers several stations with one device. It is recommended to connect 25~30 stations per Gateway for stable communication and command transmission. 14. Does the product get formal approval? We got KC certification for Evacuation Guidance Station and LPWA Gateway communication. Also, our ‘Smart Agent Evacuation Guidance Service’ received Temporary Type Approval Certificate (MAR 2016~MAR 2018) from the Ministry of the Future. 15. What kind of gas does the gas sensor in the station detect? 16. Does the smoke sensor in the station detect cigarette smoke? The embeded smoke sensor of our station can adjust the detection level from 0 to 7. Cigarette smoke can also be detected, and if you set the detection level to a lower level, you can check the cigarette smoke detection as an alarm. 17. Is it possible to load voice files as I want? The station’s voice will be configured with 123 voice messages and 55 voice combination tables. Therefore, it is possible to combine them appropriately and guide them as you desire. 18. Is there any case where the sensor is misread in the actual site? How can you solve the problem of false detection? So far, no case has been activated due to the false detection in the actual site. We consider that problem enough. To prevent this, we have set up the evacuation guidance level of temperature and gas sensors. We’re sure that sensors will not detect the value of temperature and gas indiscriminately if you set the appropriate evacuation guidance level according to the characteristics of the space. In addition, the evacuation guidance is not executed immediately when the sensor value is detected. 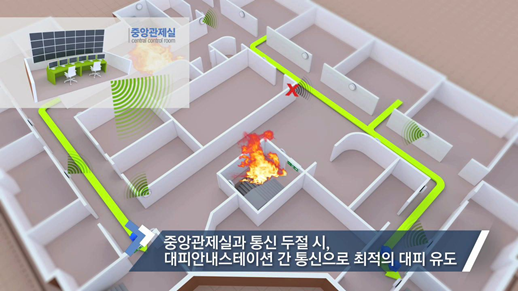 Instead, the safety manager is notified sensor’s detection and evacuation guidance is executed after the manager confirms the actual situation on the site.